Thank you for visiting this website! If you'd like further information about any specific books described, Shared Spaces or literacy-related projects, or workshop possibilities, please let me know. Vamp & Tramp Booksellers--a.k.a. 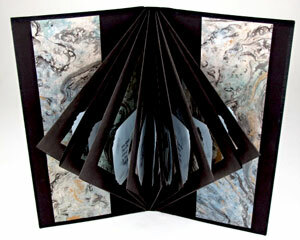 Vicky and Bill Stewart--represent many of my artist's books. Please visit the fascinating Vamp & Tramp website to see details about my available books and discuss your interests with the Stewarts. They (or I) will be happy to answer any questions you may have.